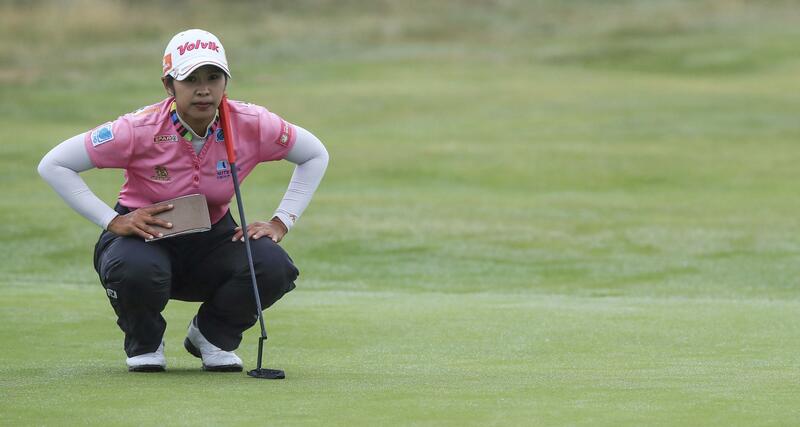 UPDATED: Fri., Aug. 3, 2018, 11:31 a.m.
LYTHAM ST. ANNES, England – Pornanong Phatlum of Thailand is standing out at the Women’s British Open for more than just her pink golf ball. While first-round leader Minjee Lee and Mamiko Higa encountered problems down the stretch at a rainy Royal Lytham to give up two-shot leads on Friday, Pornanong played a steady hand and put her pink ball in all the right places – explicitly, out of the many bunkers that define the course. Pornanong’s only top-10 at a major was a tie for seventh at the U.S. Women’s Open in 2014. She has already put some distance between many of the big names in women’s golf. Top-ranked Ariya Jutanugarn was seven shots back after rounds of 71 and 70, No. 6 Shanshan Feng (71-71) was one stroke further back, and No. 2 Inbee Park (76-74) missed the cut. Only six players were inside five shots of Pornanong. They have pedigree, though. In a three-way share of second place on 9 under is Lee, who was clear at 12 under before she double-bogeyed No. 16 and dropped another shot at No. 17 to post a 70. Lee, the Australian at a career-high ranking of No. 8, was runner-up on the Gullane links in the Ladies Scottish Open last week. Home favorite Georgia Hall (68) was in the tie for second place along with Higa, who was leading by two strokes on 11 under when she lost her ball in a gorse bush at No. 17 and wound up with a double-bogey 6. Third-ranked Park Sung-hyun, who won the Women’s PGA Championship last month, is lurking in sixth place on 7 under after rounds of 67 and 70. Seventh-ranked Ryu So-yeon, a two-time major champion, is on 6 under after two rounds of 69. Brooke Henderson of Canada aced the par-3 ninth hole on her way to a 70, which put her in a six-way tie for eighth place on 5 under. Published: Aug. 3, 2018, 9:51 a.m. Updated: Aug. 3, 2018, 11:31 a.m.